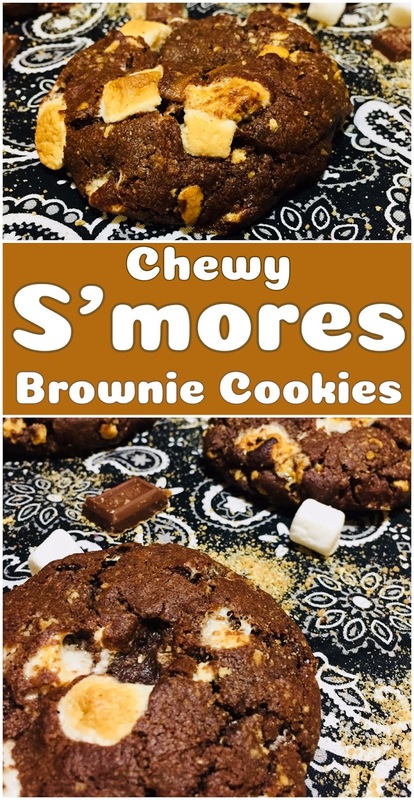 A campfire favorite, S'mores, these cookie version are a brownie cookie or brookies with mini marshmallows, coarsely ground graham crackers and chocolate chunks. Growing up, I did a little camping with Girl Scouts and that is when I was introduced to s'mores. I have gone camping in a while but I have made bonfires just to make s'mores. That is where my strange addiction started, a good strange I feel there could be worse, I would always search anything that has to deal with s'mores. It might the chocolate and graham crackers or the smoky marshmallows. These cookies might be perfect because they have so much chocolate, graham cracker and toasty marshmallows, that comes from baking in the oven no bonfire needed. I decided to create this post because on August 10th, it's National S'mores Day. So I had to make this recipes that has everything in a s'mores. What is your favorite part of a S'mores? Is is the melted chocolate, toasted marshmallow or graham cracker or all three? 1. In a food processor or in a zip lock bag, pulse graham crackers to a coarse crumb or crush to a coarse crumb. 2. In a medium sauce pan, melt butter until lightly golden brown. Add butter to cane sugar, brown sugar, chocolate chips and 1/4 cup cocoa powder, let sit for 5 minutes or until chocolate is melted. 3. Whisk in eggs and vanilla until slightly light and fluffy, 2 to 3 minutes. Sift in flour, sea salt, baking soda, baking powder and coffee. Fold in course graham cracker crumbs and mini marshmallows. 4. Cover bowl and chill for at least 2 to 3 hours. 5. Preheat oven to 350 degrees. Cover two cookie sheets with parchment paper. Scoop out 2 to 3 tablespoons of cookie dough. Press in extra marshmallows, graham crackers and chocolate pieces into the cookies. Bake in the oven for 12 to 14 minutes. 6. Let the cookies cool on the pan for 5 minutes then transfer to a wired rack to cool completely. Store in a cool ahead area so the chocolate doesn't melt. I love cookies and I love smores! Combining the two is pure genius! It's the perfect recipe to help us seamlessly transition from summer to fall. OMG these look so good! Perfect for camping! These look SO delicious! Definitely a great alternative for when you don't feel like making traditional s'mores! Wow these look AMAZING! I can not wait to try these and to be eating smore tasting food year round. These cookies look so delicious! I can't wait to try them. I love that they could be the taste of smores all year round! For someone who has only had a real Smore a couple of times in life, I'm totally obsessed with them. And there is something about that campfire taste that makes it so special. These look so good. I love that there are chunks of real marshmallow! This is perfect! I have been craving S'mores but can't build a bonfire because of a burning ban in my city. I'm going to try this with vegan marshmallows. I want to nom nom this post. Love chewy delicacies. Thanks for the easy recipe. This looks so delicious, it has graham, chocolate and marshmallows. Love your idea and recipe! Love it! I can't wait to try these! They sound and look delicious! OMG you are killing me with these :) I don't know if I will try these or the S'mores with the Ritz first??? Oh my goodness I think I died and went to heaven!! Those look AH-MAZE-ING!!!! I will need to try them for sure!! These cookies look so decadent and really delicious - a terrific summer time cookie! Yumm! So perfect when you're too lazy to make a real smore especially in this heat! Oooo these look absolutely delish! I'm going to a potluck this weekend and will be bring these with me! I am definitely serving up these cookies the next time I host ladies moving night! What a perfect treat, they (okay and me) are going to love them!! Better to share with friends so I don't eat the whole batch, omgoodness can't wait!! These cookies look to die for! I love s'mores too and combining that taste with a chocolate cookie sounds soo good! Oh these look so good! The perfect fall treat I would love to make a S'more with these talk about double stuffed! This looks so good! We love Smores but dont have a fire pit.. so these will be perfect!! These look so yummy - can't wait to try out the recipe this weekend and feast on them while lazying around :-) Thanks for sharing! Wow this looks so good- Perfect for those winter months when I don't have an open flame and am craving some smores! These look perfect for fall! Could be a great transition for a fall party. I need some of these right now! They look so yummy! I don't think I've had s'mores brownie. But definitely would love to try it. Delicious. Oh my word! These cookies look so delicious! I would love to try them sometime, especially near Christmastime. These cookies look SOOO good. I like the idea of the chocolate chunks and mini marshmallows in the cookies. OMG you were a girl scout as a kid? I always wanted to be a girl scout when I was younger! You're lucky to have experienced that! Hopefully, I will be able to get my son to be interested in boys scouts when he's older. Anyway, this recipe looks so tasty. I love smores! These are perfect for the Summer sleep overs!! These look so delicious, my mouth is watering reading this recipe, I will definitely be trying, thanks for sharing! Oh my deliciousness! I've been on a brownie kick for a couple weeks and trying to find something similar to brownies is hard. This recipe sounds amazing! I'm so excited to try it! This is ok for diets right?? 😂😂 they look so chewy and gooey, I’ll have to give them a try. OMG these look incredible. S'mores are basically the only reason I like camping!! I love getting the marshmallows super crispy and melted on the inside. This is definitely how I'd want to celebrate National S'more day! These look SO good! These cookies remind me of my childhood!! They sound absolutely amazing, and I'm sure they taste even better than a S'more! I will be saving this one to make this summer and into fall! Your recipes always looks SO yummy!! OMG these sound like summer in a cookie! My whole family would gobble these up! Omg smores COOKIE? Be still, my heart. I will definitely make these this summer. What a brilliant idea for a cookie! I am going to make this, likely this Winter when I wish I was camping ;) Nothing says camping like a good old s'more! Hard to choose which part of the s'mores is my fave because they all contribute to make it a tasty treat! I would so make this cookie version! It's the best of both worlds! Cookies and brownies yumm! yum! I was just telling my husband yesterday how good smores sounded to me! Cookie addition? I love these! Can't wait to make these for our son, they look amazing! oh my goodness - this recipe is scrumptious!! I love s’mores and cookies but never thought of combining the two. This sounds so tasty!! S'mores is my favorite sweet treat! this version looks to die for! Thank you for sharing! I was undecided on what snacks to prepare on Saturday for my kids little day camp and this chewy smores brownie cookie is a great idea. Thank you for sharing the recipe. These images look so decadent. I just want to grab one through my computer screen. The recipe looks pretty easy to make so I think i'll try it this weekend. These sound so delicious! I love smores, and a smores cookie sounds divine!